The Tensor Mechanics module is used in a variety of pure mechanics simulations and in combined physics simulations with the Heat Transfer, Phase Field, Contact, Porous Flow, and XFEM modules; use the MOOSE combined module to perform simulations with multiple physics modules. The following figures show results from a few different simulations performed by tensor mechanics module users. Evolution of rock failure zone in a 300m-wide, 400m-deep panel in a coal mining application. Evolution of the resolved shear stress on the slip system in a polycrystalline simulation of BCC Iron. 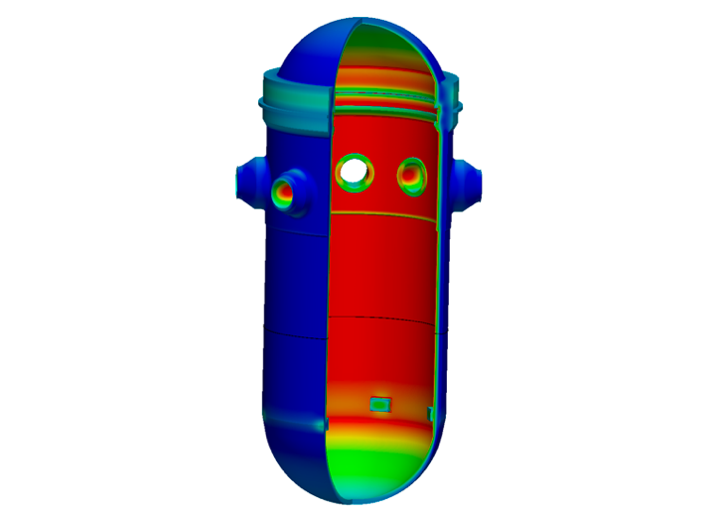 Thermo-mechanical stress analysis of a reactor pressure vessel. Interested in performing some of these simulations yourself? Use the links below to learn more about the tensor mechanics module and to get started with your own continuum mechanics and combined physics simulations. These types of code classes make up the core of the tensor mechanics module. Now you're ready to start creating your own mechanics simulations. The tensor mechanics module is being developed by users at national laboratories and universities around the world. Contact the developers through the moose-users email list. Consider becoming a developer yourself. The tensor mechanics module uses code syntax based on tensor forms. This approach allows the constitutive tensor equations to be implemented, clearly and concisely, in the same format as written in mathematical notation. Follow the MOOSE standards for contributing code and documentation.